Burnished Gold Tone, Black Suede & Wrapped Thread, Fish Hook (earrings), Tassel Charm Necklace & Earring Set. Length 16" + extender. Earrings 1 3/8". Drop 3 3/4". 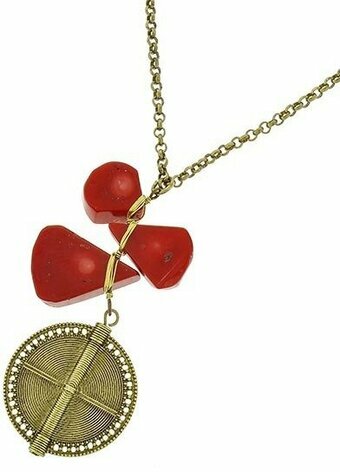 Burnished Gold Tone, Red Stone Pendant Necklace. Length 19" + extender. Pendant 1 1/2" X 2 3/4". 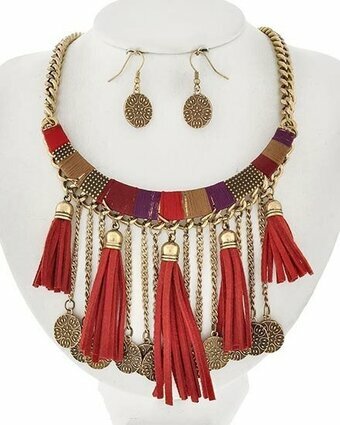 Burnished Gold Tone, Red Suede & Wrapped Thread, Fish Hook (earrings), Tassel Charm Necklace & Earring Set. Length 16" + extender. Earrings 1 3/8". Drop 3 3/4". 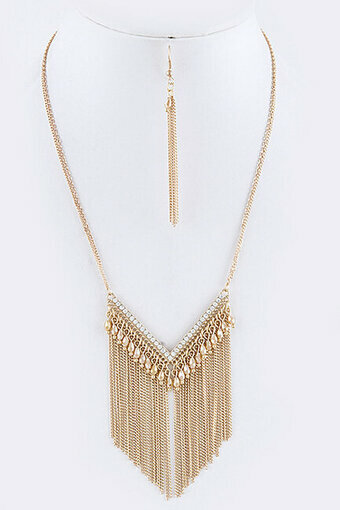 Gold cable chain necklace. 6 x 11mm links. 24 inch piece. 1 piece per package. Approximately 18" length. Lobster claw clasp with 3" extender. Earrings: Drop Approximately 3.0". Fish hook. Worn separate or layered together, these coordinated necklaces form our Delicately Yours collection are perfect for highlighting your neckline with a golden matte finish. Geometric in their style, these necklaces come two to a pack featuring a rhinestone covered arrow pendant and an openwork triangle pendant. 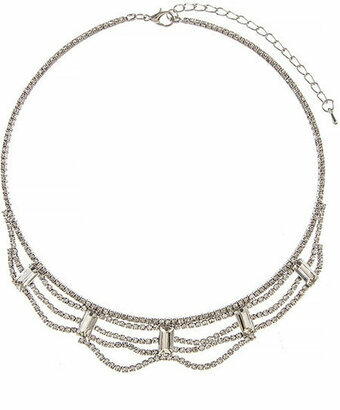 Including a 16 and 19-inch necklace, each jewelry piece is complete with chain extenders. 2 necklaces per package. Length approximately 30" with 3.2" extender. Lobster claw clasp. Length approximately 18.4" with 2" extender. Lobster claw clasp. Length approximately 30" with 3" extender. Lobster claw clasp. Rhodiumized, Clear Rhinestone, Metal, Mother's Day Heart With Mom Pendant Necklace. Length 15 1/2" + extender. Pendant 1 1/4" X 1". Length approximately 12" with 3" extender. Lobster claw clasp. Burnished Copper Tone Turquoise Stone, Fish Hook (earrings), Crescent Pendant Long Necklace & Earring Set. Length 30" + extender. Pendant 2 3/4" X 2 1/2". Earrings 3/4". Cream Pearl Look Acrylic Seed Beads Multi Strand Necklace & Earring Set. Length 20 1/2" + extender. Earrings 2 1/4" with 1" drop. Minimal in their style, these necklaces come two to a pack featuring sideways cross pendants. One cross is characterized by a smooth surface while the other is covered with crystal rhinestones. Crystal Encrusted Pineapple Tassle Accent Pendant Necklace Set. Approximately 24" length. Lobster claw clasp with 3" extender. Length approx. 18" with 3" extender, Lobster claw clasp. Length approximately 5.2" with 3.4" extender. Lobster claw clasp. Approximately 30" length. Lobster claw clasp with 3" extender. Approximately 18" length. Lobster claw clasp with 2" extender. Approximately 24" length. Lobster claw clasp with 3" extender. Length approximately 15" with 3.3" extender. Lobster claw clasp. Faux Turquoise Bird Accent Squash Blossom Necklace Set. Approximately 22" length. Lobster claw clasp with 3" extender. 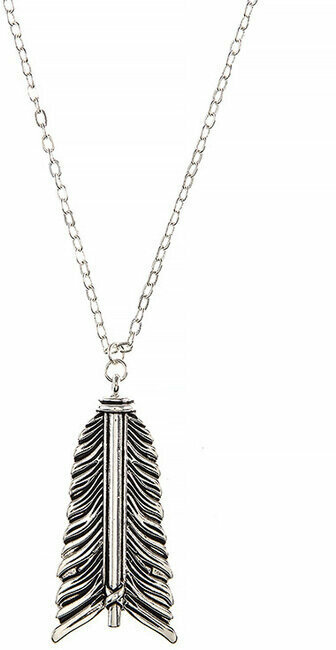 Feather Pendant Semi Precious Stone Accent Necklace Set. Approximately 24" length. Lobster claw clasp with 3" extender. 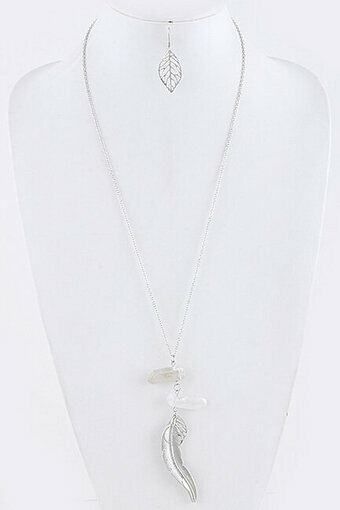 Gold & Gold Silver Tone, White Stone Necklace. Length 19" + extender. Drop 3/8". Gold Tone Brown Tortoise Acrylic Black Cord Pendant Necklace. Length 19" + extender. Pendant 2 1/2" X 1 1/2". Gold Tone Clear Cubic Zirconia Delicate Necklace. Length 16 1/2" + extender. Pendant 1/2" diameter. Gold Tone, Clear Rhinestone, Post (earrings), Sea Life Starfish Necklace & Earring Set. Length 16" + extender. Pendant 5/8" X 7/8". Earrings 1/4". 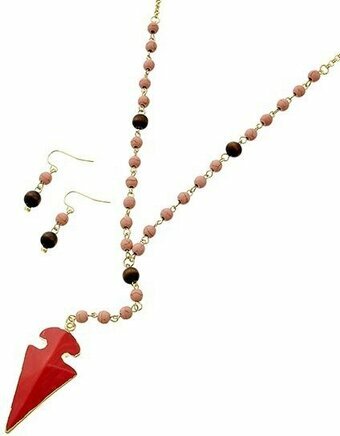 Gold Tone, Peach Stone & Coral Acrylic, Fish Hook (earrings), Western Theme Arrowhead Y-neck Long Necklace & Earring Set. Length 30" + extender. Pendant 1" X 4 3/4". Earrings 1". Gold Tone Hematite Necklace. Length 17 1/2" + extender. Pendant 3/4 X 5/8". Gold Tone, Mint Suede, Post (earrings), Multi Strand Pendant Necklace & Earring Set. Length 18" + extender. Earrings 1/4" diameter. Drop 1 7/8". Gold Tone Natural Glass Necklace. Length 17 1/2" + extender. Pendant 3/4 X 5/8". Gold Tone, Clear Rhinestone, Metal, Fish Hook (earrings), Tree Pendant Necklace & Earring Set. Length 16 1/2" + extender. Pendant 1/2". Earrings 1 1/4". Gold Tone, Turquoise Semi-precious Stone, Mint Thread, Fish Hook (earrings), Tassel Necklace & Earring Set. Length 20 1/2" + extender. Pendant 3/4" X 3 3/4". Earrings 3/4". This simple gold necklace features the word COURAGE in script writing. Each necklace comes on a gold chain. This simple silver necklace features the word CREATE in script writing. Each necklace comes on a silver chain. This simple gold necklace features the word DREAM in script writing. Each necklace comes on a gold chain. This simple silver necklace features the word HOPE in script writing. Each necklace comes on a silver chain. This simple silver necklace features the word INSPIRE in script writing. Each necklace comes on a silver chain. This simple gold necklace features the word LAUGH in script writing. Each necklace comes on a gold chain. This simple gold necklace features the word LOVE in script writing. Each necklace comes on a gold chain.